I love when we can have a Disney Parks Blog series that spans both Disneyland and Walt Disney World Resorts, so many thanks to my fellow author, Nate Rasmussen, for the excellent story on the Mark IV Monorail. Today, we return to the Disneyland Resort to continue our look at the history of the Disneyland Monorail with the Mark V.
The most recognizable difference with the Mark V, compared to its predecessor, the Mark III, was its look. Designed to resemble the Mark IV monorail at Walt Disney World Resort, this new model was white with an accent color stripe running along the side. The four different colored stripes along the Mark V Monorails were red, blue, orange and purple. Another major difference was the new path the Disneyland Monorail would travel. In 1994, the path was diverted to run above the Eeyore section of the original Disneyland parking lot (remember that?) to accommodate the construction of Indiana Jones Adventure. 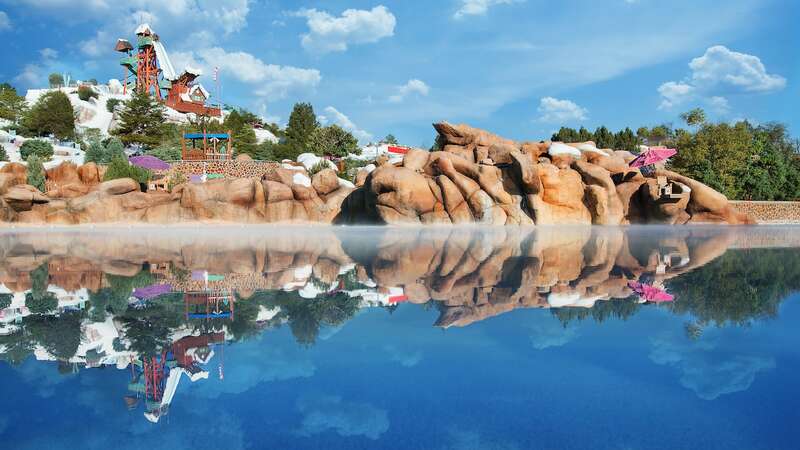 Then in 1999, when construction began on Disney California Adventure park, Disney’s Grand Californian Hotel & Spa and the Downtown Disney District, portions of the track were re-routed to accommodate these additions. The opening of the Downtown Disney District also provided an opportunity for a brand-new station to be constructed for the Disneyland Monorail. When the station opened in 2001, it provided a convenient second entrance to Disneyland park, which is still available for guests today. Check back next month, when I hand the controls back to Nate Rasmussen, who will tell us about the Mark VI Monorail, which currently travels the “highway in the sky” at the Walt Disney World Resort. Hi Erin! Thanks for this series. I love all the details you put into it. I learn something new every time. I was wondering if you know anything about being able to ride in the back of the Monorail? I know we’re able to sit in the front but had heard that guests are no longer able to sit in the back? Have you heard anything about that? I keep meaning to check myself but forget while I’m there, haha. Perhaps the most frustrating thing about these History of the Monorail posts (and others like the Steam Train Engines posts) is that they are too brief! Tantalizing little bits of history that make us salivate for more of the complete story! Thankfully, Disneyland has a fandom that is ready to step in and provide more of the details. I think this is unique to Disneyland, since most of the “regulars” are locals that visit multiple times per year. WDW’s fan base, being comprised primarily of out-of-town vacationers, just doesn’t seem to get into the “nitty gritty” as much as the Disneylanders do! So thanks to the commenters here that have helped to bring even more informational fun and value to Erin’s original post. My little contribution: The WDW Mark IV Monorail trains were larger (roomier inside, more headroom) than the Disneyland Mark III trains, and although similar in appearance to the WDW Mark IVs, the new Disneyland Mark Vs were smaller than their WDW cousins. But slightly bigger inside than the Disneyland Mark IIIs, which was made possible by the elimination of the beloved bubble on top. The limiting factors for the sizing of the new Disneyland Monorail trains was the size and weight capacity of the beamway, and the clearance where portions of the track go underneath itself. WDW’s much beefier Monorail beamway generally never crosses underneath itself, Disneyland’s does so multiple times in the portions over Tomorrowland! The most critical occurrence is just where the Monorail departs the Tomorrowland Station and exits the park for its run up Harbor Blvd. on it’s way to DCA and Downtown Disney – right at that point past the station, the Monorail has to duck under the portion of track where the Monorails re-enter Tomorrowland from their long journey back from Downtown Disney. The relatively short vertical distance between the upper and lower tracks there govern how big the trains can be! Eliminating the Bubble from the Mark Vs allowed the top of the full train to rise to the height of the top of the Mark III’s bubble, thus providing for more headroom for passengers inside the cabin. The height of the current Disneyland Mark VII trains is also limited by these factors. Also, when WDW switched out the original Mark IV trains for the newer (and much larger still, i.e. most passengers can stand upright in them!) Mark VI trains, the Mark IVs were sold to Las Vegas and had a second life serving passengers on the monorail system that was established there! Kevin, you’ve made some interesting points. Thanks for looking into it. Google Earth is such a great resource. Additionally, your note about possible relocation of certain monorail pylons is partially correct. There are areas, as you’ve mentioned, where a tunnel required longer pylons compared to what was originally there. The same is true where the monorail travels over Disneyland Drive. Since the street had to be made sunken due to the Downtown Disney pedestrian bridge, longer pylons had to go in where the ground distance under the monorail beam had increased. 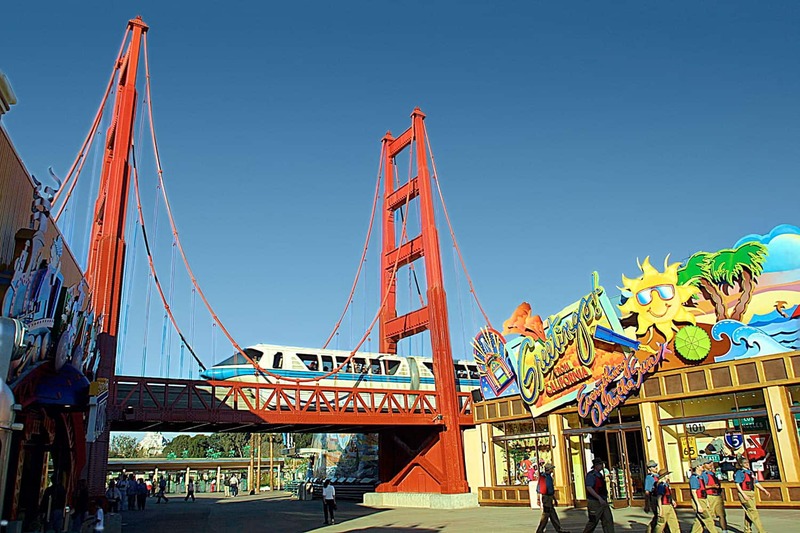 Also, to Erin’s credit, I do want to mention that during construction for Disney California Adventure, the Monorail did take an operation detour by traveling bi-directionally on the northern portion of the track to keep the trains from going over areas that were unsafe. If this is what she meant when she said the Monorail was re-routed, then she would be correct. Her initial description, however, led me to think she was referring to the track physically being moved as was done in 1994 with the construction of Indiana Jones. 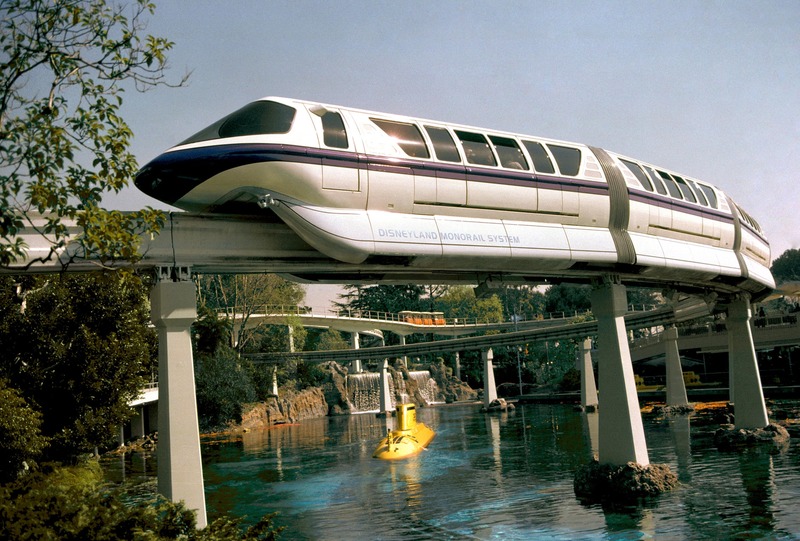 This was my favorite Monorail… so many good times riding these when I was a kid; I just love the look of it. I distinctly rememner the new DTD monorail station being built in a slightly different place than the previous station at the hotel. It is not much of a difference but I absolutely remember riding the monorail from the hotel and seeing the new station being built just a few hundred feet away. The original station was a bit south and slightly west. Erin, I appreciate the update. However, I beg to differ. Did the folks at the Walt Disney Archives tell you where the re-routing was done? Here’s what I do know… The length of track that travels alongside Harbor Boulevard has not changed. Same for the section that cuts through Disney California Adventure. 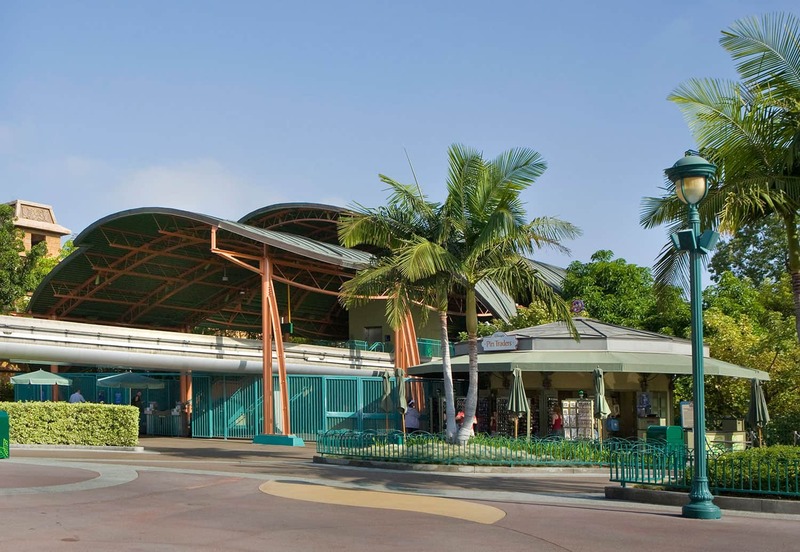 And of course, you and I agree that the Downtown Disney Station was built on the site of the former Hotel Station. Thanks for sharing a bit of history regarding the Mark V monorails, which I actually like a lot better than the current Mark VII trains. First, I do want to clarify that, while the beamway was re-routed for the new Indiana Jones Adventure in 1994, no portion of track was re-routed during the construction of Disney California Adventure, Downtown Disney and Disney’s Grand Californian Hotel & Spa. At that time, everything new was built around the existing beamway. Somehow, this is a common misperception among park guests who believe that the Monorail once stopped at the Disneyland Hotel, and now no longer goes there. While the Monorail now stops in Downtown Disney, the truth is the newer station is in the exact same spot that the Disneyland Hotel Station was. What many don’t remember was the Travelport below the station, Mickey’s Corner gift shop, Neon Cactus, Goofy’s Kitchen, and Maize’s Pantry – an entire hotel complex that gave the sense the Monorail was actually part of the hotel. In its place, we now have Rainforest Cafe, ESPN Zone and the AMC Theatres that now “separate” the Monorail from the Disneyland Hotel. But back to the Mark V monorail, one thing I appreciate is that there used to be four of these trains. Up until the late 90s, Disneyland would have three of the four trains in operation at one time. The frequency of the monorail coming into a busy Disneyland Hotel Station was so quick, that a long line really wasn’t much of a wait at all. Thanks, Ryan. You’re right about the portion of the track closest to the Disneyland Hotel, but my friends at the Walt Disney Archives confirmed that other portions of the track were rerouted during the expansion of the Disneyland Resort. I loved reading this post and seeing all the photos, thank you! I love Disneyland Resort so much, mainly because that’s where Walt Disney actually walked around. That means so much to me. Great photos of the Monorails, I need to share this post. Great story Erin. My son loves the monorail. We ride it every time we visit the parks. When is the next Meet Up BTW? there have been two at WDW already this year. Just sayin.